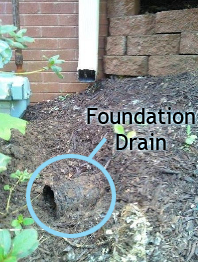 When water is penetration your basement at the joint of the floor and the wall…Locate your foundation drains, most all of the homes in the Metro Atlanta area have foundation drains installed. These drains run around the exterior of the foundation wall at the footing. The pipes “tail” out where the basement walls transition from poured concrete to stud walls most of the time. These drains can be located with a shovel and opened to drain at the corner of the house, many times this is enough to release hydro-static pressure and help control water is entering the basement between the floor and the wall.